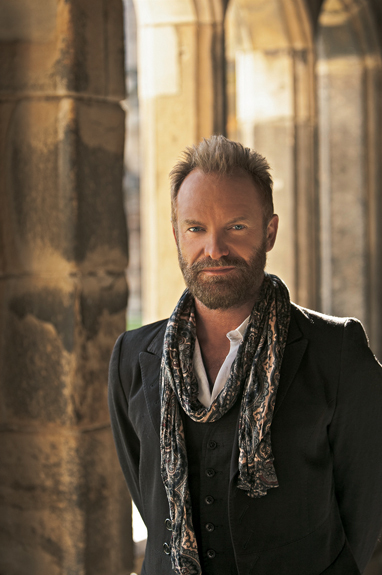 Sting has released "If On a Winter's Night." Long story short: I’m a Jew with discerning musical tastes – and a weird and inexplicable thing for Christmas music. It’s not that I wake up on a mid-August morn, craving to hear Burl Ives croon “Have a Holly Jolly Christmas,” or wondering what a rockabilly version of “Silver Bells” by the Rev. Horton Heat might sound like. (Although I confess, at various times of year, I hear in my head a fantasy version of Roy Orbison singing “I’ll Be Home for Christmas.”)Then mid-autumn comes around, and with it announcements of the upcoming batch of Christmas CDs (and the smaller smattering of Hanukkah albums). And willingly, I get sucked in: Whoa, Bootsy Collins doing “Silent Night?” A kids album of hip-hop Christmas tunes (“Yo, It’s Christmas”)? I’m in. I admit, a good part of the fascination isn’t to see how good these are, but how truly awful. You haven’t lived till you’ve heard Italian tenor Andrea Bocelli – backed by the Muppets, I kid you not – seriously overdoing “Jingle Bells.” Talk about laughing all the way.As the recorded music industry tanks, the Christmas music segment seems robust. Every concept, every style, every artist is on board. I have on my shelves (tucked waaaay in back) holiday albums by Alvin & the Chipmunks and Keith Sweat, reggae- and power ballad-themed Christmas albums, CDs by local folks. There’s even a growing list of Christmas CDs by Jewish artists, including the Klezmonauts’ “Oy to the World,” and new additions from Bob Dylan, Neil Diamond and Barry Manilow.I guess the holiday brings out a sentimentality in me that isn’t much evident the other 364 days of the year. As Steve Goodman’s “Colorado Christmas” – hands down, my favorite Christmas carol – has it, there’s nothing like “a quiet Christmas morning in the Colorado snow.” And an essential ingredient for that experience is music. Everything from the Nitty Gritty Dirt Band’s sublime version of “Colorado Christmas” to the cheesiest, most sacrilegious take on “Silent Night.”Here’s what I’ve been listening to, repeatedly, and will continue to listen to until Dec. 26. When I can finally get back to real music. Can’t picture Sting singing “Santa Claus Is Coming to Town?” Neither can he. “If On a Winter’s Night” is inspired more by winter and the story of Christ’s birth, than by men in red outfits. Sting digs deep into the English tradition to come up with such off-the-beaten-track tunes as “There Is No Rise of Such Virtue” and “Now Winter Comes Slowly,” and he contributes his own songs, including “The Hounds of Winter,” and “You Only Cross My Mind,” with Sting’s lyrics set to music by Bach.The music is as ambitious as the material. Each song gets its own setting: the traditional “Cherry Tree Carol” is Sting alone, on guitar and vocal; the wonderful “Soul Cake” gets strings, horns and the Webb Sisters on backing vocals. All of it is done gently, with a respect for the season and evoking the hushed, ancient quality of a walk through snowy woods. A beautiful album that will play as well in mid-February as it does on Christmas Eve. Bob Dylan plays it straight on his first Christmas album. He hasn’t reverted to his hell-and-damnation days of “Slow Train Coming”; he’s more concerned with chestnuts roasting on an open fire, rather than souls roasting in hell. For material, Dylan seems to have conducted a survey of the most popular holiday songs – “Silver Bells,” “Little Drummer Boy” and “Winter Wonderland,” right up through “The Christmas Song” – making this, oddly, one of the most tradition-bound of holiday albums. In a career, a life, of unexplained transformations, this fits right in.On the musical side, Dylan’s current band is supplemented by David Hidalgo of Los Lobos, who gives a Tex-Mex kick to the inspired “Must Be Santa.” Dylan has come to a comfortable truce with his voice, settling for a pleasant croak, and he rounds up a bevy of backing singers who balance out the idiosyncrasies of Dylan’s sound. His voice comes to life on a version of “The Christmas Blues,” and he gives a mighty effort throughout, as evidenced by “O’ Come All Ye Faithful,” where he sings the first verse in the Latin, “Adeste Fidelis.”Any jokes here are played visually. The inside jacket features ’50s pin-up girl Bettie Page, her Santa outfit not exactly covering her … ummm … gifts; another photo has a few Christmas-attired musicians, the one in the center looking surly, stoned and bereft of the holiday spirit. (That producer’s credit going to Jack Frost isn’t exactly a joke: Dylan’s been using that alias for years. Maybe he knew he was building to a Christmas album? )One very major disappointment: not one original song here. I would love to hear Dylan’s contribution to the Christmas repertoire.Proceeds from “Christmas in the Heart” go to Feeding America and other organizations that provide meals to the needy. To find out how much schmaltz you get when you combine Michael McDonald and Christmas carols, you don’t add the two together; you multiply. McDonald sounds like he’s doing his over-the-top Michael McDonald impersonation, layering on the faux-soul on Stevie Wonder’s “That’s What Christmas Means to Me,” standards like “White Christmas,” and the Donnie Hathaway title track. He seems to save his most overblown moments for the most sacred songs – “Children Go Where I Send Thee,” “God Rest Ye Merry Gentlemen” – and the result is just unholy. John Cowan, best-known as singer-bassist of New Grass Revival, goes mostly the acoustic route here. But a stomping, gospel/R&B take on Jesse Winchester’s “Let’s Make a Baby King” suggests there might have been a better approach. For those spending Christmas with a martini in an anonymous hotel lounge instead of hot cocoa in front of the home fireplace (and those who wish they were), this chill-out mix is for you.